Maybe you’re unpacking your Premium Starter Kit, you were gifted a bunch of essential oils—you lucky thing—or, like some of us, you dove head-first into essential oils because you knew there was something special about them. Now you’re overwhelmed by how to use oils! Well you’re definitely not alone. We’ve all been intimidated by how to use essential oils, asked our friends for a chart on essential oils uses, and scoured Pinterest for guides on essential oil uses. With a little practice and this simple guide, you’ll get the hang of it in no time. In fact, you’ll be the friend who gets all the “How do I use this essential oil?” texts! 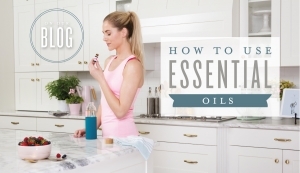 To master your use of Young Living oils, you’ll need to understand a few essential oil basics. 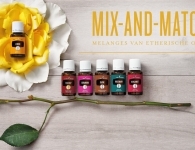 Typically, oils are used in one of three ways. Get to know the basics with our essential oil usage list—guaranteed to help you answer some of the most-asked beginner questions. The aromatic use of essential oils may be the most familiar. Perhaps you’ve wandered into a spa and been delighted by the aroma of Eucalyptus and Tea Tree oils or maybe felt the soothing calm of Lavender’s scent in one of your favourite at-home products. 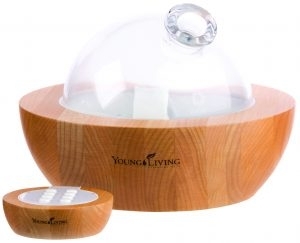 Now you can learn how to get the benefits of essential oils by diffusing their aroma! If you don’t know how to use an essential oil diffuser, check the instructions specific to your product for water and oil ratios. For instance, if you’re using the Young Living Aria™ diffuser, you’ll add 15–25 drops of oil to the water, but if you are using Young Living’s Dewdrop Diffuser, use only 8–10 drops. There’s always a bit of mathematics involved but you’ll soon perfect your own DIY diffuser blend! Even without a diffuser, you can enjoy many of the aromatic benefits of essential oils. Add drops of your favourite essential oils to a cotton ball and place it in areas where you want to disperse the scent. You’ll be amazed by how well this simple solution works! Freshen a smelly space in minutes by adding a few drops of your favourite citrus oils on a cotton ball, then place it in a gym bag, bin or anywhere else that needs a scent upgrade. The topical use of essential oils is one of the most popular. Once you get the hang of this application, it will quickly become one of your favourites! Usually, finding out how to use essential oils on the skin is what turns most people from casual oil users to devotees. Use your head, literally! Essential oils can be applied to the crown of your head, behind the ears, to your neck and to your temples. If the aroma of an oil is too strong or your skin is sensitive, you can dilute it with a carrier oil. Young Living’s V-6™ Vegetable Oil Complex lets you adjust the strength of the oil according to your preference. You can apply essential oils to most parts of your body, but you want to be cautious of your most sensitive skin, as well as taking care to avoid your eyes. To get the most benefit from your essential oils, you’ll find that certain applications are more effective than others. Essential oils are great for massage! For a calming massage, Lavender and Cedarwood essential oils can be added to a carrier oil. For rejuvenating muscles after a long workout, experience the cooling effect of Peppermint essential oil’s menthol in a sports massage. In aroma care, many people choose to apply essential oils to the tops and soles of the feet. 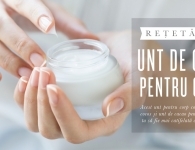 For cosmetic use, one common application is using Tea Tree essential oil as part of spa and beauty treatments—especially to help fight foot odour pre-pedicure. Just 10–15 drops in a bath of lukewarm water ought to do the trick. 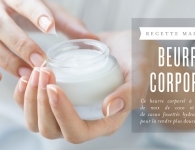 Some essential oils can help improve the appearance of healthy skin! 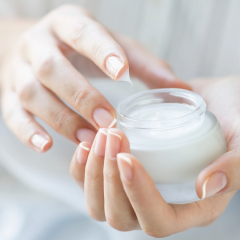 With these tricks in your arsenal, you’ll know how to use essential oils on skin to help reduce the appearance of blemishes and to give yourself a healthy glow! Tea Tree essential oil is also a great skincare oil—use a cotton swab to apply the oil directly to areas of congestion to help improve the appearance of your skin. For a refreshing boost, try adding Bergamot essential oil to your night-time routine. Keep in mind that Bergamot and other citrus oils can cause photosensitivity, so you should avoid sun exposure after application. How to use Young Living Plus oils internally? Did you know that you can get the benefits of some essential oils by ingesting them? Add Young Living’s Plus line of essential oil food supplements to your day for a boost of natural flavour! Adding a drop or two of your your favourite Plus oil to water throughout the day is a great way to stay hydrated. Oils like Lemon+, Tangerine+ and Orange+ provide a hint of flavour in a calorie-free replacement for carbonated drinks or juice. Other flavours like Peppermint+ and Thieves+ provide a spicy kick throughout your day. Adding essential oils to recipes is a great way to get potent and unique flavours into your favourite foods. Love homemade ice cream? Add a sophisticated twist with Lavender+ and fresh blueberry ice cream. To give your pasta sauces authentic Italia flair, just a single drop of both Oregano+ and Rosemary+ oil will give your meals powerful flavour. If you love Thai food, try adding Lemongrass+ and Ginger+ oils to soups and marinades. Less is more! You can always add another drop, so start slow, whether you’re using your oils topically or aromatically, or Young Living Plus oils internally. Do not put essential oils in eyes, ears, nose or other areas with sensitive skin. From your first bottle of Lavender essential oil to a seven-oil DIY diffuser blend, learning how to use essential oils is a process. We’re happy to help you every step of the way! 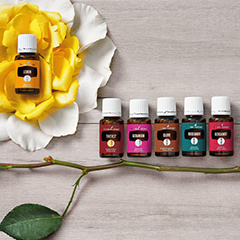 This essential oil uses guide is only the beginning—let us know in the comments below if you have more questions!